A new survey finds that seven-in-ten Americans (71%) say there should be a way for people in the United States illegally to remain in this country if they meet certain requirements, while 27% say they should not be allowed to stay legally. 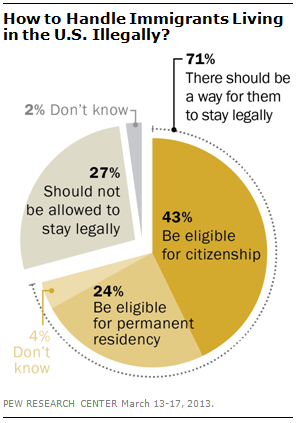 Most who favor providing illegal immigrants with some form of legal status –43% of the public – say they should be allowed to apply for citizenship, but 24% of the public says they should only be allowed to apply for legal residency. Majorities across all demographic and political groups say there should be a way for illegal immigrants who meet certain requirements to stay in the U.S. legally. Among those who favor providing legal status, the balance of opinion is in favor of allowing those here illegally who meet the requirements to apply for citizenship. However, no more than about half in any demographic group supports permitting illegal immigrants to apply for citizenship. The national survey by the Pew Research Center, conducted March 13-17 among 1,501 adults, finds that overall attitudes about immigrants in the United States are more positive than negative, despite the nation’s struggling economy. A Detailed Look at the Immigrant Population in the U.S. Thinking about immigrants generally, 49% of Americans say they strengthen the country because of their hard work and talents, while 41% say they are a burden because they take jobs, health care and housing. In a June 2010 poll, 39% said immigrants strengthened the country while 50% said they were a burden. In addition, more Americans think that the growing number of newcomers in the United States strengthens society than believe that they threaten traditional American customs and values. About half (52%) say the growing number of newcomers in the U.S. strengthens society, while 43% say the influx of newcomers threatens traditional American values and customs. Support for granting legal status to illegal immigrants is wide ranging. Eight-in-ten non-Hispanic blacks (82%) and Hispanics (80%) say those in the United States illegally should be allowed to stay if they meet certain requirements; about half of blacks (52%) and Hispanics (49%) say illegal immigrants should be able to apply for citizenship. Two-thirds of non-Hispanic whites (67%) say illegal immigrants should be allowed to stay in the country legally, while 31% say they should not. Four-in-ten whites say people in the United States illegally should have the chance to apply for citizenship if they meet certain requirements. Among whites with no college degree, 61% favor allowing those in the U.S. illegally to stay legally, while 37% disagree. There is more support among white college graduates for permitting illegal immigrants to stay in the country legally (81% say they should, while just 17% say they should not). The partisan differences over providing some form of legal status for illegal immigrants are modest: 76% of Democrats, 70% of independents and 64% of Republicans say illegal immigrants should be allowed to stay in the United States if they meet certain requirements. Whites in both parties are divided along educational lines over how to deal with illegal immigrants in the United States: Among white Democrats and Democratic-leaning independents, 92% of college graduates favor allowing illegal immigrants to stay in the U.S. legally if they meet certain requirements; support falls to 68% among white Democrats and Democratic leaners who have not completed college. Similarly, there is a 20-point education gap among white Republicans and GOP-leaning independents (75% of college graduates vs. 55% of non-college grads). The balance of opinion on these questions has fluctuated over the years. Two years ago, opinions were evenly divided and in June 2010, more said that immigrants were a burden than a strength for the United States (50% vs. 39%). Nearly two decades ago, in July 1994, 63% viewed immigrants as a burden, but the percentage expressing this view declined substantially by the end of the 1990s (to 38% in September 2000). In recent years, there has been little change in opinions about the impact of newcomers from other countries on traditional values. About half (52%) say the growing number of newcomers from to the United States strengthens American society, while 43% say they threaten traditional American customs and values. While majorities across all groups support legal status for illegal immigrants, there are sharp differences in opinions about the impact of immigrants on the country. Opinions about immigrants have become somewhat more positive among most groups since 2010. Fully 74% of Hispanics say that immigrants strengthen the country because of their hard work and talents. About half of blacks (52%) also say that immigrants strengthen the country, compared with just 41% of whites. While most Democrats (58%) say that immigrants strengthen the country because of their hard work and talents, most Republicans (55%) say they are a burden because they take jobs and health care. College graduates express far more positive opinions about the impact of immigrants than do those with less education. Fully 67% say immigrants strengthen the country, compared with 41% of those with no more than a high school education. By a wide margin (59% to 33%), more 18-to-29 year-olds say that immigrants strengthen the country than say they are burden. 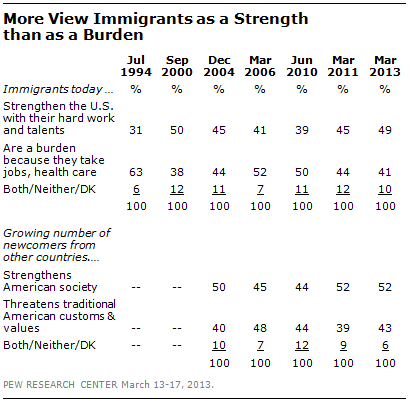 Among those 65 and older, more say immigrants are a burden (49%) than a strength (37%). Opinions about whether the growing number of newcomers to the United States strengthens society or threatens American values break down along similar lines. Whites are divided (45% vs. 49%). Majorities of Hispanics (67%) and blacks (62%) say the growing number of newcomers strengthens American society. Majorities of Democrats (61%) and independents (55%) say that the increasing number of newcomers strengthens society; just 34% of Republicans agree. 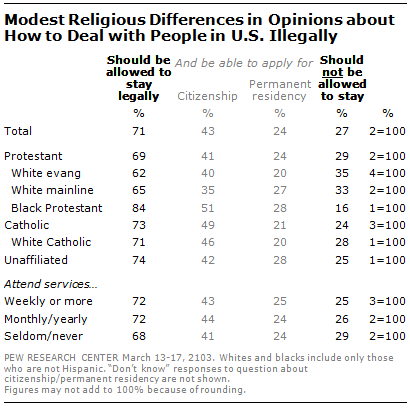 Majorities of all major religious groups say there should be a way for immigrants who are currently in the U.S. illegally and who meet certain requirements to stay in the country. For the most part, those who favor legal status for illegal immigrants say they should be allowed to apply for citizenship. Opinions among major religious groups are more divided when it comes to the impact of immigrants on the country. A majority of white evangelical Protestants (55%) say that immigrants are burden because they take jobs, housing and health care, while about as many (58%) say they threaten traditional American customs and values. 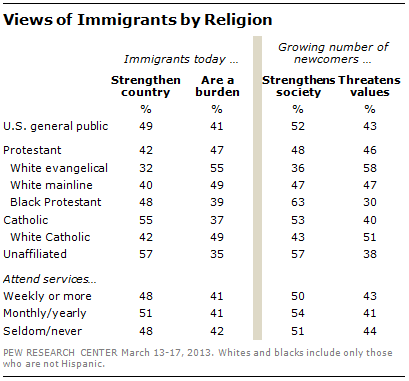 Other religious groups have less negative views of the impact of immigrants. These differences in opinions, however, are largely the result of underlying differences between religious groups in race, political ideology, party identification and other factors; after controlling for these factors, the independent impact of religion is minimal.